The simulation found jet engine shafts from airlines flown into the World Trade Center "flew through the building like bullets," according to an Associated Press vide report. Flaming jet fuel cascaded through the tower stripping away fireproofing material and causing the building to collapse, the AP video reports. "The weight of the aircraft's fuel, when ignited, acted like a flash flood of flaming liquid," according to the video. However, Kevin Ryan has already demonstrated that there was not enough energy from the airplane impacts to have knocked much of the fireproofing off. See also this article. And very few of the core columns were severed by the planes' impact. And tests by NIST showed that temperatures in the Twin Towers never got hot enough to significantly weaken the structural steel of the 47-column inner core. Researchers have stated that the Purdue simulation contradicts the observed facts in other ways, and in the next couple of weeks, they will publish their findings. (1) The simulation either fails to include, or inaccurately represents, the 47 core columns holding up each of the Twin Towers. (2) Most of the jet fuel burned outside the buildings, especially in the case of the South Tower - which produced a glowing orange fireball as the building was struck at an oblique angle. So the simulation could not hold true for the South Tower. (3) The people who designed the Twin Towers did not think that an airplane plus fire from the jet fuel could bring the buildings down. Indeed, they assumed that "all the fuel (from the airplane) would dump into the building", and yet assumed "The building structure would still be there." Since most of the fuel (especially with the South Tower) exploded outside of the buildings, shouldn't they "still be there"? (4) Even if the planes and fire had initiated a collapse sequence, why did the towers totally collapse, when no modern steel-framed building has ever before completely collapsed due to fire? (5) Why did they collapse at virtually free-fall speed? And why did WTC7 -- which wasn't even hit by a plane -- totally collapse at free-fall speed later that same day? (6) How could the buildings have fallen at near free-fall speed, indicating very little resistance, and yet produce tremendous pulverization of concrete, which indicates great resistance? (7) No one can explain why "steel columns in building 7 were "PARTLY EVAPORATED in extraordinarily high temperatures" (pay-per-view). Absent controlled demolition, how could such temperatures have been generated by jet fuel or diesel? "1. Were columns on the south face of WTC severed by aircraft impact? NIST says maybe one, but Purdue now suggests several. NCSTAR1, p. 22-23. 2. Was there any jet fuel in AA11's center fule tank? NIST says no, but Purdue now says yes, it was completely full. NCTSAR1-5A, p liii, lviii. 3. How did the fieproofing get "widely dislodged"? NIST suggests the aircraft debris turned into shotgun blasts to affect this. Purdue now suggests the jet fuel did it. Thanks to Purdue for invalidating NIST's work. NCSTAR1, p 119." In other words, not only does the Purdue simulation contain many of the same errors as the NIST reports, but, as if that's not bad enough, it stretches the truth beyond even what NIST itself has done. “Many may conclude that the building structure of the World Trade Center twin towers was poorly designed with fire retardants that the heat from the airliner explosions within an hour caused catastrophic destruction of the south tower, and in less than 2 hours the north tower. However, the evidence overwhelmingly supports a different conclusion: this collapse was in fact caused by explosive devices planted well in advance." Indeed, numerous scientists, engineers and demolition experts have said the official version of the destruction of the World Trade Centers is impossible. Please go to Truthdig and see how this Purdue simulation is being used against 9/11truth. Robert Scheer's TruthDig.com is a real gatekeeker's hangout, where negative comments outweigh truther posts (they have never posted one of my posts). Go to this site and try your best to make your pitch in a common sense, non hysteric, concise manner. they do their best to dumb us down to the lowest level possible. 7man on Wed, 06/20/2007 - 12:58pm. Commented on TruthDig. Awaiting moderation. In order to eliminate spam and off-topic posts, we moderate comments by unregistered contributors and there will be a slight delay before it appears on the site. If you are registered and logged in, your comment will be immediately published. Meanwhile, you can return to the article, read another article, email this article to a friend, or head back to the home page." chucksheen on Wed, 06/20/2007 - 1:05pm. It is actually very easy to debunk this animation. I have looked at their simulation before and found in the notes that they based their "physically realistic" animation upon the FEMA report. In other words, it is my understanding that they assume the column damage implied by the FEMA report is "physically realistic" and then created a model to match that. The computer simulation shows certainly a very unrealistic amount of internal damage that appears to be consistent with the highly speculative (read: not "physically realistic") FEMA report. M. Pauline Baker, Dave Bock, Randy Heiland, and Michael Stephens. Waterways Experiment Station, Technical Report, 1998.
impact force”, Nuclear Engineering and Design, Vol. 140, 373-385, 1993. Management Agency, FEMA 403, May 2002. Why is it that they relied on the data from FEMA instead of NIST? I can think of one reason... isn't the hypothetical damage in the FEMA more than given in the NIST? By pretending there was more damage it would support the official story that planes caused the towers to collapse. This in itself has little merit because the building designers considered exactly this type of an event. Arabesque on Wed, 06/20/2007 - 1:10pm. type code or else its very hard to read. GeorgeWashington on Wed, 06/20/2007 - 1:13pm. I know... I should fix that problem. It works fine in Firefox. Does anyone know of an easy way to convert a word document file into HTML? I've been looking for a problem free way to do this for quite a while. Arabesque on Wed, 06/20/2007 - 1:19pm. go into the "Compose" mode of blogger (as opposed to "Edit Html", you can just copy and paste what you've got in Word. Try that. Hopefully, blogger's scripts won't mess up your footnotes. GeorgeWashington on Wed, 06/20/2007 - 1:23pm. I found another way to fix the problem, and it works in internet explorer now. I tried posting from word to blogger and that's how the problem actually came up in the first place. Arabesque on Wed, 06/20/2007 - 1:46pm. Sorry, because i can't make a new topic for unknow reasons so i reply to your post. If your actualy read their paper on page 4, you can found some intesresting information. state of the core’s structural elements." So we can't be sure the core columns actualy have the right performance in the animation. Roger on Wed, 06/20/2007 - 8:29pm. yes, funny how CBS News decided to omit that fact from its broadcast tonight. Chris on Wed, 06/20/2007 - 8:37pm. PU? Yep something smells mighty funny alright. Anyone follow the money on this? What kind of grants did this guy get following his pentagon "analysis"? You are correct. There is absolutely nothing new here. This has been thrown into the mix for purely psychological effect. When the truth is widley known, some of these institutions PU/MIT will NEVER be able to live down their association with this criminal coverup. st8nme on Thu, 06/21/2007 - 1:14pm. How was it possible the Pentagon was hit 1 hour and 20 minutes after the attacks began? Why was there no response from Andrews Air Force Base, just 10 miles away and home to Air National Guard units charged with defending the skies above the nation''s capital? How did Hani Hanjour, a man who failed as a Cessna pilot on his first flight in a Boeing, execute a difficult aerobatic maneuver to strike the Pentagon? Why did the attack strike the just-renovated side, which was largely empty and opposite from the high command? I challenge someone to look at all of the credible 9/11 websites and show me how many of them claim that no 757 hit the Pentagon. So that when you accuse me of being a shill (instead of debating my arguments), you will see I have pretty good company. Arabesque on Thu, 06/21/2007 - 8:15pm. The problem you have . . .
is explaining the disappearance of the plane inside the building. If you are relying on Purdue, which has been thoroughly discredited, you should reconsider. Ningen on Thu, 06/21/2007 - 11:00pm. This "simulation" is nothing more than a cartoon that rehashes old falsehoods. It is anti-science as it studiously avoids all of the real problems with the OCT. I, for one, do not see how anyone could take it seriously. Pure nonsense. Alvin R on Wed, 06/20/2007 - 1:50pm. Numerical lies in . . .
Ningen on Wed, 06/20/2007 - 9:44pm. arguments from Arabesque's paper and elsewhere. GeorgeWashington on Wed, 06/20/2007 - 2:18pm. A new study into the collapse of the World Trade Center towers has been released that correlates with the findings of the 2005 National Institute of Standards and Technology (NIST) report and supports the theory that intense fires weakened the structure and initiated "global collapse". Much like the NIST report however, it is fatally flawed. A computer simulation of the 2001 World Trade Center attacks supports a federal agency's findings that the initial impact from the hijacked airplanes stripped away crucial fireproofing material and that the weakened towers collapsed under their own weight. In reality the new study by structural engineers at Purdue University does not provide any scientific evidence to explain the collapses, it merely confirms the NIST fireproofing claim in its animation and then jumps to the same conclusions as NIST, conclusions that fly in the face of the laws of physics. 1. Even if the fireproofing had been removed the idea that a regular office fire could weaken steel and cause buckling requires a leap of faith to say the least. We know that the steel components were certified to ASTM E119. The time temperature curves for this standard require the samples to be exposed to temperatures around 2000F for several hours. And as we all agree, the steel applied met those specifications. Additionally, I think we can all agree that even un-fireproofed steel will not melt until reaching red-hot temperatures of nearly 3000F. Now I'm no physicist but given that Jet fuel doesn't even burn to those temperatures (No fuel, not even jet fuel, which is really just refined kerosene, will burn hotter than 1500 degrees Fahrenheit) the idea that "ordinary office fires" would is patently farcical. The study does not explain how the concrete in the buildings was completely pulverized. The study does not explain the presence of molten metal at the base of the buildings after their collapse, which was confirmed by multiple sources as well as eyewitnesses. The study does not even take into account building 7 which was not hit by a plane and collapsed in 6.5 seconds into its own footprint at 5.30pm. The fireproofing in that building was certainly not dislodged yet all its core columns collapsed at exactly the same time despite fire (caused by falling debris from the towers) being restricted to just a few floors. In addition there are literally hundreds of eyewitnesses, including reporters, firefighters and rescue workers, who stated that they heard explosions prior to the collapses. There were so many that CNN's news feed even displayed the words "Third Explosion collapses World Trade Center" and the FBI announced that they believed secondary devices were involved. Yesterday we revealed details of another high level official who is on record stating that he witnessed explosions in building 7 before either tower collapsed. In conclusion the new study, like NIST's before it, is yet another case of a body attempting to prove a pre-determined hypothesis. It does not discount any of the points we have continually raised and does not make the case for an independent investigation any less imperative. Chris on Wed, 06/20/2007 - 5:07pm. Purdue also produced a Pentagon Simulation in 2002 !!! But the combined mass of everything inside the plane – particularly the large amount of fuel onboard – can be likened to a huge river crashing into the building. 911veritas on Wed, 06/20/2007 - 5:21pm. RAWSTORY going 911 truth on us? Jumbo-Jets Can Not Demolish Skyscrapers. jkeogh on Wed, 06/20/2007 - 5:47pm. Osama bin Laden may have chartered a plane that carried his family members and Saudi nationals out of the United States after the September 11, 2001 attacks, said FBI documents released Wednesday. The papers, obtained through the Freedom of Information Act, were made public by Judicial Watch, a Washington-based group that investigates government corruption. One FBI document referred to a Ryan Air 727 airplane that departed Los Angeles International Airport on September 19, 2001, and was said to have carried Saudi nationals out of the United States. "The plane was chartered either by the Saudi Arabian royal family or Osama bin Laden," according to the document, which was among 224 pages posted online. The flight made stops in Orlando, Florida; Washington, DC; and Boston, Massachusetts and eventually left its passengers in Paris the following day. In all, the documents detail six flights between September 14 and September 24 that evacuated Saudi nationals and bin Laden family members, Judicial Watch said in a statement. "Incredibly, not a single Saudi national nor any of the bin Laden family members possessed any information of investigative value," Judicial Watch said. "These documents contain numerous errors and inconsistencies which call to question the thoroughness of the FBI's investigation of the Saudi flights. "For example, on one document, the FBI claims to have interviewed 20 of 23 passengers on the Ryan International Airlines flight ... on another document the FBI claims to have interviewed 15 to 22 passengers on the same flight." "No political intervention was found. And most important, the FBI conducted a satisfactory screening of Saudi nationals that left on chartered flights. This is all available in the report," Kolko said. On the issue of flights of Saudi nationals leaving the United States, the 9-11 report said: "We found no evidence of political intervention" to facilitate the departure of Saudi nationals. The commission also said: "Our own independent review of the Saudi nationals involved confirms that no one with known links to terrorism departed on these flights." Meredith Diliberto, an attorney with Judicial Watch, said that her group had seen a first version of the documents in 2005, although the FBI had heavily redacted the texts to black out names, including all references to bin Laden. Nevertheless, unedited footnotes in the texts allowed lawyers to determine that bin Laden's name had been redacted. They pressed the issue in court and in November 2006, the FBI was ordered to re-release the documents. Diliberto said mention that "either" bin Laden or Saudi royals had chartered the flight "really threw us for a loop." "When you combine that with some of the family members not being interviewed, we found it very disturbing." Chris on Wed, 06/20/2007 - 5:56pm. GeorgeWashington on Wed, 06/20/2007 - 7:13pm. Eyes glaze over when you talk temperatures, fall speeds, etc. The enemy knows what works: freighted soundbites. Wow, "flash flood of flaming liquid." Facts are not the point. Propaganda is the point. Propaganda is not designed to defeat critical thinkers, but to give nonthinkers their excuse. So fight fire with fire - truthaganda! Somewhere a 9-11 agnostic begged for a test, a WTC I-beam laying across a flaming tank of Jet-A fuel. That demonstration would end this nonsense. Show the burned I-beam holding a heavy load. Make up your own script. Add a welded cross joint to the experiment. Do lots of close-ups and temp readings. Maybe ae911truth.org and pilotsfor911truth.org could pull it off. Pilots buy fuel every day, and architects can find an I-beam. Even college students could probably do it. Julie7 on Thu, 06/21/2007 - 5:13am. (3) American 11 hit the north tower's core head on, whereas United 175 hit the South Tower's core on the corner, so the fuel in American 11 is likely to have done more damage to the core (if you happen to believe Purdue, which I don't). In addition, Mete Sozen, who is at Purdue and was involved in the simulation, was also involved in the ASCE's Pentagon building performance report. Kevin Fenton on Thu, 06/21/2007 - 6:22am. ... according to the NIST report, the first external movement in the North Tower during the collapse is on floor 98, indicating that the collapse initiated on this floor. As 98 was only hit by a wing tip and was 99% intact after the impact, how come it failed before lower floors (for example 95 and 96) that sustained the full impact and jet fuel release, and were allegedly tens of times worse off? Kevin Fenton on Thu, 06/21/2007 - 9:31am. I hate to be a pain, but it would help if you cited to which page of which NIST NCSTAR says this. Thanks for raising this very good question. Ningen on Thu, 06/21/2007 - 11:09am. "10:28:22 First exterior sign of collapse (downward movement of building of building exterior). Tilting of the building section above the impact and fire area to due south as the structural collapse initiated. First exterior sign of downward movement of building at floor 98." "9:58:59 First exterior sign of collapse (downward movement of building exterior). The northeast corner tilted counterclockwise around the base of floor 82." The main sections about the collapses in the NIST report do not mention which floor the collapse is first visible on, this information is from a section entitled "Collection of Recovered Steel". After going through it frame by frame I don't know how many times, I think 98 is right - if you want to check, I think the first downward movement is visible in the right-hand (i.e. northwest) corner of the tower near the top of the region smoke is coming from. Amusingly, the new paper by Bazant and Greening says the collapses start on 96 and 81 and cites the NIST report (without a page reference) for this. Kevin Fenton on Thu, 06/21/2007 - 1:47pm. Now I'm really going to be a pain - I think we should cite to NCSTAR #, then page number. I don't know which is the main report. But that helps a lot and I don't mean to seem ungrateful, and you raise a very interesting point. I wonder though if there was smoke obscuring the lower floor where movement would be expected, so that NIST may not be saying where movement began but where it was first visible. Were you able to see that in Hoffman's frames? Ningen on Thu, 06/21/2007 - 11:06pm. In the video at Hoffman's site some sections of lower floors (beneath 98) are obscured, but some are visible and I can't see them moving before 98 does. The claim the collapse started at 98 is based on my own observation, which tallies with that of NIST. The claim the collapse started on 96 is based on what? Nothing that I can see. Somebody just made it up and everybody repeated it, but nobody checked. I must have read that table in the main report I don't know how many times, before another poster here, Shoestring, drew my attention to it and what it actually meant. You read something 3 times and don't get it, then you read it a fourth time and get it. Kevin Fenton on Fri, 06/22/2007 - 2:10am. As these are the most dense parts of the plane, two engines should do more damage to the core than the one that supposedly hit the core of the South Tower. Ningen on Thu, 06/21/2007 - 11:11am. Winds aloft on 9/11 . . . Ever try cooking on the barbie, without putting the lid down, on a windy day? Roasting marshmallows over the campfire on a windy night? The morning of 9/11 was cool and windy, out of the North, down from Canada eh. (Maybe someone can lookup the aviation WX data, winds at 1500?) I was outside since 7:30AM so I know. Also been on the roofs of the towers many times and the wind there is much more than ground level. Lots of open windows and extra ventilation holes in the towers that morning too. Seems to me the heat models assume no ventilation, no airflow, nowhere for the heat to go but into the steel so it "melts" and whatever. Anyone see a problem with this picture? 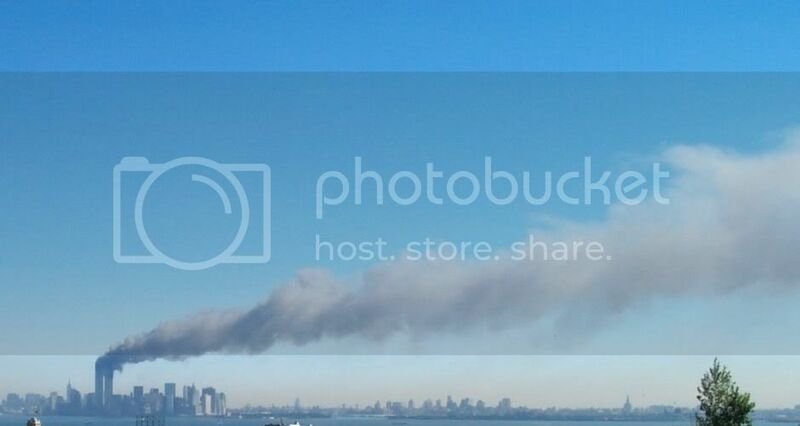 Nearly horizontal smoke, which gets out but meanwhile the heat stays in, and hot air usually rises except on 9/11/01. Because a dog does nothing for political reasons. Co6aka on Thu, 06/21/2007 - 7:42am. kate of the kiosk on Thu, 06/21/2007 - 2:52pm. My, my, looks like someone's got too much time on his hands. I wonder, is the marquee the result of fakery? rm on Fri, 06/22/2007 - 3:20am.